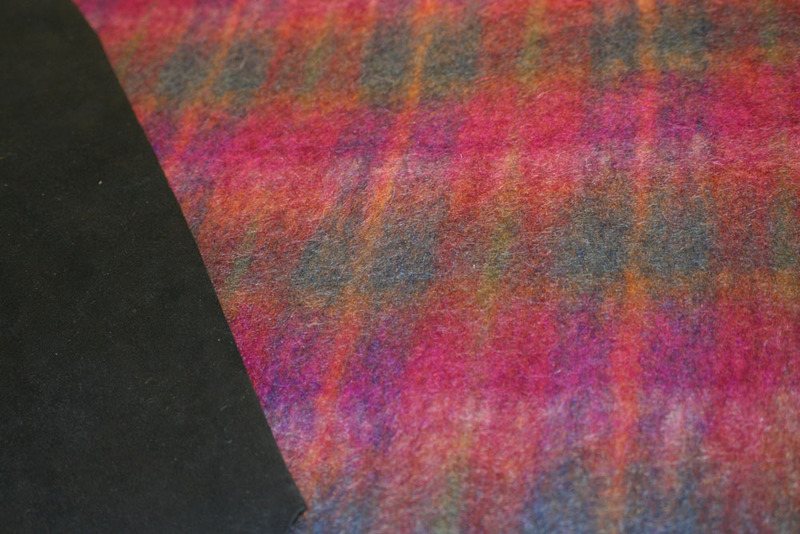 I just remembered the brushed mohair I bought at Britex, thinking to use it as an underlining!Â It will be just perfect.Â One piece is a pink/black/white plaid that I don’t like at all, but the other is a blue/gold/purple/fuchsia diffuse plaid that I really like.Â It’s big enough to do an entire coat mockup with, too. Tomorrow I have to be up in SF for work, so I’ll stop by Fabric Outlet and check out their suede collection, to see if they’ve got other colors.Â I have 3 yards of white silk jacquard that I think will do for a lining, and some extra silk charmeuse in case that’s not enough.Â I will, of course, dye it to match the mohair (perhaps blue, perhaps a bright fuchsia); I think I’ll do that tonight.Â I’ll also soak the mohair in warm water, spin it out, and let it dry flat.Â That should preshrink it nicely.Â After assembly, it’ll be dry clean only, but I want to make sure it doesn’t shrink too much when pressed. So not only do I have some nice fabrics to use, but I’m clearing out stash as well!Â Now this is a test project I can feel good about!